Are There Any Silver Linings in BlackBerry's Soft Earnings? As BlackBerry continues to deal with its business evolution, investors need to dig beyond the surface headlines to understand the current state of affairs. 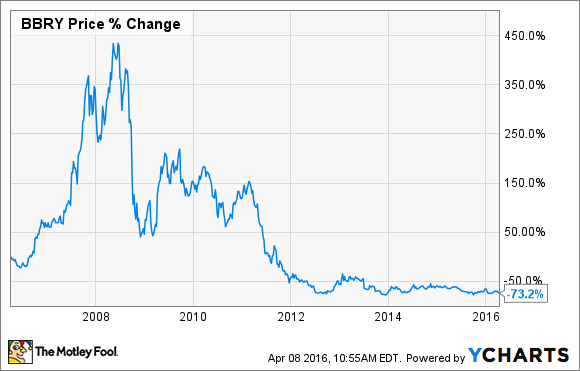 If you're like most tech investors, you probably haven't thought about BlackBerry (NYSE:BB) in a while. The early smartphone pioneer failed to keep pace with the likes of Apple (NASDAQ:AAPL), Samsung, and Alphabet (NASDAQ:GOOG) (NASDAQ:GOOG), which led to spectacular declines in its market share and stock price. The company soldiers on with a new strategy, centered largely on software and services. However, shares sank earlier this month on yet another disappointing earnings report. Are there any positives for BlackBerry beyond the headline figures? The leading numbers don't inspire much confidence. Fiscal 2016 annual sales totaled $2.2 billion, down approximately 33% from the $3.3 billion the company reported in fiscal 2015. Quarterly revenue contracted at a more gradual pace, falling 30% from $660 million in the same quarter last year to $464 million. BlackBerry continued its string of net losses -- $238 million for its fiscal Q4 and $208 million for the full fiscal year. Excluding certain charges, such as costs associated with its restructuring program, BlackBerry says its Q4 net loss would have been closer to $18 million. Neither figure reads well. But let's delve one level deeper. Source: BlackBerry investor relations. Figures in millions. The key area to focus on is BlackBerry's Software and Services segment, which stands alone in representing the company's future path toward profitability. Though Software and Services revenue didn't grow relative to the fiscal third quarter, it remained essentially flat amid sharp sales contractions in the other two divisions. What's more, the general trend has been largely positive over the past four quarters, ever since BlackBerry instituted its three-segment reporting structure. For the entire fiscal year, the company surpassed its reported internal goal of generating $500 million in Software amd Services revenue. The challenge in analyzing BlackBerry is that it's really two companies in one. You have the legacy handset business and service access fees (SAFs), both of which figure to continue to decline. This quarter again proved that BlackBerry's handset division is effectively done. The company launched its Priv smartphone, the first BlackBerry device to run on Alphabet's Android mobile OS, to little fanfare. Some had wondered whether BlackBerry's design might reattract users who had defected from the platform because of its increasingly thin selection of apps. However, not even Alphabet's smartphone software could help BlackBerry's handset prospects. The company said shipments of smartphones declined from 700,000 in the third quarter to 600,000 in during its recent report. For context, Apple sold 74.8 million iPhone in Q4 of calendar 2015, and Samsung sold 85.6 million. Stick a fork in BlackBerry's handset division. Similarly, the SAF division should continue to fade in the coming years. BlackBerry historically charged SAFs to access the company's secure services. However, with usage of older BlackBerry operating systems declining and the rise of new secure alternatives, such as Apple's iMessage and others, fewer and fewer reasons exist for customers to continue to pay SAFs. In its public filings, BlackBerry routinely signals this downward trend as likely to continue. We can all agree the future isn't rosy for either division, which leaves Software and Services as the lone potential bright spot on which BlackBerry can stake its future. And it does offer plenty of potential upside. One particular area of interest is BlackBerry's QNX software division, which figures to compete quite nicely against Apple and Alphabet in the software that will power future autonomous vehicles. Yet not even Software and Services is growing like a weed. It's not displaying the kind of growth that would prove its success is highly likely. Such is the head-scratching scenario at BlackBerry. Down but not out, the company makes it too hard to tell whether its future is bankable.